Russia is ready to draft a currency union with other members of the Eurasian Economic Union (EEU), said Russian Prime Minister Dmitry Medvedev. "We could consider the possibility and conditions of launching a monetary union in the long term. We are ready to work out the issue with other colleagues,” said the PM at a session of the Eurasian Intergovernmental Council in Kazakhstan Friday. 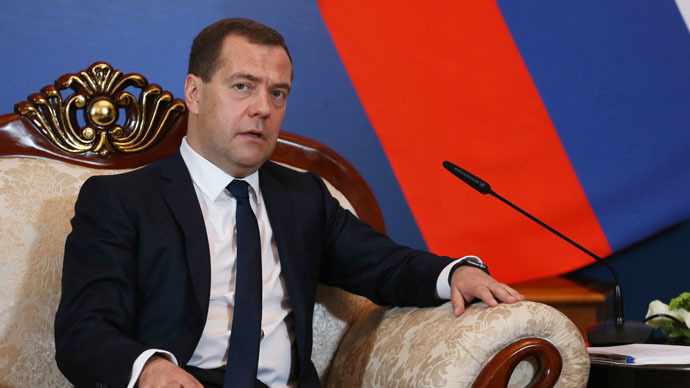 More than 40 countries and associations have said they would like to boost trade with the EEU, said Medvedev. Medvedev stressed that the global economy was facing numerous challenges and said closer cooperation was necessary to address them. All measures should be taken “in coordination, not isolation,” he added. "It [economic problems - Ed.] affected the state of bilateral trade and investment cooperation, we are obliged to solve these problems within the framework of existing integration mechanisms," said Medvedev. The Eurasian Economic Union (EEU) was created in 2015 on the basis of the Customs Union of Russia, Kazakhstan and Belarus. It currently has four members: Armenia, Belarus, Kazakhstan, and Russia. Ratification procedures are currently under way for Kyrgyzstan to join the trade bloc, withTajikistan being as a prospective member. One of the first attempts to enhance economic cooperation between the former Soviet republics took place in 1999, when Russia, Belarus, Kazakhstan, Kyrgyzstan, and Tajikistan signed the Agreement on the Customs Union and the Single Economic Space. India, China, Tunisia, Egypt and Israel have already expressed interest in setting up a free trade zone with the Russian-led EEU, while Vietnam is expected to sign the deal on Friday.